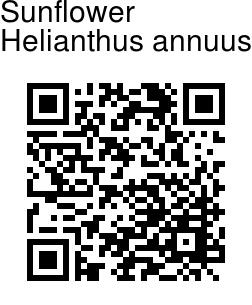 In Greek "helios" means sun and "anthos" means flower, thus Sunflower. The name is just apt for a plant that turns its flower to face directly into the sun as it passes and also looks like the sun in its yellow rays. Helianthus annuus is a highly variable species that is indigenous to North America. There are so many different-looking cultivars of sunflower that it's hard to make generalizations about the whole species. Most sunflowers are tall 8-15 ft (2.4-4.6 m); most have rough-hairy oval to heart shaped leaves; most have large flowerheads 8-12 in (20-30.5 cm) across; and most have yellow ray florets and purplish brown disk florets. The ray florets of sunflowers are sterile, and only the disk florets produce seeds. All the sunflower cultivars are fast-growing annuals, and many are rather rank coarse-textured plants. 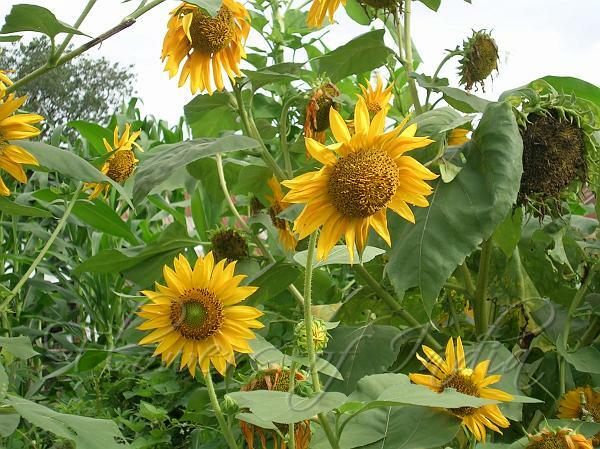 Sunflowers are easy to grow in any well-drained, neutral to slightly alkaline soil. Add lime if your soil is acidic.